To continue and to improve my process of recording my research, especially when I search online databases. It's so easy to quickly enter one search term after another, without stopping to record which spelling variation or soundex code I used in each search. I know I waste time by repeating searches later on. I think I'll create a form to help me. To cite my sources properly. It's a lot of work, especially to go back and re-cite 20 years' worth of information that I used to enter in note form on my computer. Now that I have RootsMagic, its computerized source citation forms will ease that process, but it still will be time-consuming. My goal for this year is to get all the sources I currently have for my children's father's and my direct ancestors through our great-great-grandparents' generation cited properly. This includes printing up a lot of census records that I have accessed on Ancestry.com, but have not bothered to add to my hard copy files. 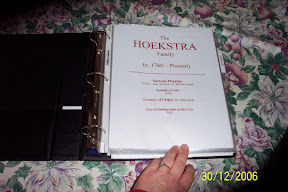 To photograph and log my genealogical "treasures," items that have once belonged to my ancestors and late relatives. My friend Beverly Smith Vorpahl once wrote a terrific article about the importance of documenting these items, so that they will not be carelessly disposed of in the event of your death. I also plan to continue to take steps to preserve these items and to educate myself in areas where I am not sure of how to do so. I have already ordered two books by Maureen Taylor, Uncovering Your Ancestry Through Family Photographs and Preserving Your Family Photographs: How to Organize, Present, and Restore Your Precious Family Images that should help me in these areas. To begin to slowly change my hard copy files from a file folder system to a notebook system, using archival-safe, acid-free page protectors. Currently, I have all my hard copies for each surname I'm researching jumbled together within one (or more) file folder(s). This is not very organized, and downright messy. I have so much information now. I want to organize it by generation. 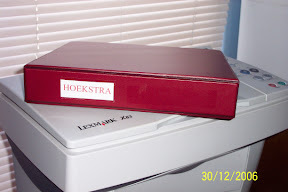 I already started this project for my HOEKSTRA files. It's going to be time-consuming and expensive, but I have to think about the big picture: having hard copy data stored in a preservable format. 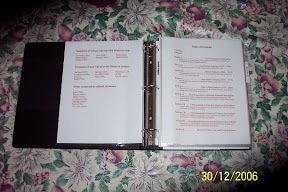 I plan to color code the D-ring notebooks: blue for my father's lines, red for my mother's, green for my father-in-law's black for my mother-in-law's, and white for my Location and Subject files (county and state resources and research topics such as probate, land, military records, etc.). The name that was given to me at my birth was Miriam Joy Robbins. Now that I am married, it is Miriam Joy Midkiff, but professionally I go by Miriam Robbins Midkiff. My mom picked out my name from the Bible. Miriam was the sister of Moses, a prophetess, who danced when the Egyptians were destroyed in the Red Sea, and who grumbled with her brother, the high priest Aaron, against Moses' leadership. Her punishment was a temporary case of leprosy. My parents picked out Bible names for all of us children, either as first or middle names. They served as missionaries to Native Alaskan communities for many years, and so Bible names were a natural pick. My great-grandmother, Lillian Fern (STRONG) HOEKSTRA, absolutely loved the name Mary. She gave it to herself as a nickname, and named her youngest daughter Mary. She also had a granddaughter named Mary. When I was nine months old, my parents went back to their hometowns in Western Michigan for several months, and during that time, we visited Great-grandma. She wanted my mother to change my name to Mary. Diplomatically, Mom told her grandmother that I was used to my name now, and that besides, Miriam was a variation of the name Mary, anyway. Miriam is the Hebrew version of the Greek name Mary. The roots of both names come from the Hebrew word for "myrrh," the dried sap of a tree native to Somalia and eastern Ethiopia that is mentioned frequently in the Bible. For years, I did not like my first name, because it was a) hard to spell; b) hard to pronounce; and c) every name meaning book I read said Miriam meant "bitter." Then one day I came across an extended explanation of my name. While myrrh is indeed bitter, it is the base for healing ointments, incense, and perfumes. It was one of the three gifts the Wise Men brought to the infant Jesus. When the women went to Jesus' tomb on Easter Morning, they brought spices with them. It is likely that they had myrrh, as it was used to embalm bodies (and it covered up the smell of decay). Myrrh was worth more than its weight in gold in ancient times. The extant meaning, then, of Miriam is "bitterness turned into sweet fragrance," a definition much more acceptable to me! "Joy," my middle name, is self-explanatory. My maiden name, Robbins, means "son of Robin." The name Robin is a nickname for Robert, which itself means "bright fame" or "red." Midkiff is still a puzzle. It is probably a U.S. southern dialect pronunciation of Metcalf(e), which means "meat calf." My younger brother could not pronounce Miriam when he was a toddler, so he called me "Mimi" for a few years, which is actually a standard nickname for Miriam (along with "Mim"). My younger sister also called me "Mimi." I prefer children to call me "Mrs. Midkiff," although I don't mind teenagers addressing me by my first name (I notice, however, that my teenage children's friends tend to either call me "Mrs. Midkiff," or simply avoid my name altogether when addressing me). Because I work at a middle school, the students there naturally call me "Mrs. Midkiff." All my names (except for my middle name) are difficult to spell and pronounce. I could make long lists of the way they have been butchered in pronunciation and mis-spelled over the years! What is curious to me is that Midkiff, which is so easy to pronounce (yes, MID-kiff) is constantly pronounced "Metcalf" by strangers. It has also been mis-spelled as Midriff and Midkiss ("f" sounds like "s" over the phone, I figured out, so now when I have to give my name via telephone, I spell it out "M-I-D-K-I-double-F-as-in-Frank). Robbins is easy, too, but I constantly got "Robinson," "Roberts," and "Robertson." And Miriam is generally mis-pronounced as "MAIR-yum." The correct pronunciation is MEER-ee-um. Just two days ago, a clerk mis-read my name on my debit card and called me Mariah. Marion, Maryann, and Muriel are other mis-nomers. This explains why I named my children Melissa and Matthew. No odd names, no odd spellings! 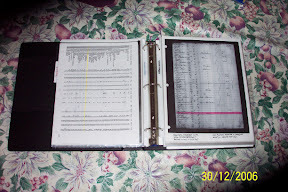 My main theme in 2006 was to get documentation for my great-great-grandparents' generation. I think I did pretty well. I searched for 8 birth records and came up with 4 (one was a duplicate, though). During my search, I did find quite a few birth records for siblings of these ancestors, which expanded my knowledge of their families as whole groups. I now have 6 of the 8 marriage records and 9 of 16 death records needed for this generation. I have 15 obits and 15 grave photos for this generation, thanks to the wonderful volunteers at RAOGK and Find A Grave. Speaking of RAOGK and Find A Grave, I performed many volunteer services doing records lookups and some gravestone photography at local cemeteries. I researched the life of Herman THOENI, a gardener for the Campbells, a wealthy Spokane family from the turn of the century, whose home is now a part of the Northwest Museum of Arts and Culture. I also took on more responsibilities for my local genealogical society. Helping out the genealogical community is one way of paying forward the many favors I have received over the years! My husband's ancestry is one that we've had a lot of info on for many years, but precious little documentation, so this year, I started gathering evidence to support all the events I have listed for his ancestors: vital and census records, obits and grave photos. I started keeping better track of my research, using research log forms bound in a notebook, as well as a research log in Notepad, and this blog. I don't always have time to sit down and blog my research notes, but I can always quickly whip open my Notepad log and jot down a few notes, everyday. I learned this trick in an article in Smart Computing magazine: Open Notepad and in the first line of the file, type .LOG (make sure you enter this in all uppercase). Press ENTER twice. Then choose File and Save. Create a name like "Research Log" and file in a folder you'll easily remember ("Genealogy," etc.). I created a shortcut to my desktop by right-clicking on the folder icon and choosing "create a shortcut." Then I can easily access it. The cool thing about this Research Log is that every time you open it, it date and time stamps the log, so it's all ready for you to record your notes. I purchased a copy of RootsMagic, upgrading from my old Family Origins software. I love that it has an electronic form for easy citations of sources! I also purchased GenSmarts, and it has given me tons of possibilities for finding and researching documents of my ancestors. I was able to obtain a good used laptap, and although it doesn't currently have a wireless card, it is handy to do non-Internet computer tasks. We also upgraded to a new, larger, faster computer with a flat screen monitor, and DSL Internet connection. These technological upgrades and additions help make Internet research faster, more efficient, and productive. Through my local community college district, I taught online genealogy for three quarters, as well as two Internet genealogy classes for my local genealogy society. I didn't get much of a chance to add to my Atlas Project website, but did create another genealogy site for a client. Now that I've listed what I've done, I can write about what I want to achieve in 2007. Gerald R. Ford, 38th President, died yesterday at the age of 93. He was born in my ancestral city, Grand Rapids, Kent County, Michigan, where 29 of my direct ancestors were either born, married, lived, or died. That doesn't count the many other siblings, cousins, aunts, uncles of ancestors that also made Grand Rapids their home. My Grandfather DeVries attended South High School with him (a grade behind Ford), and later attended the University of Michigan, Ford's alma mater. My family came over to our house to spend Christmas Day: my parents, my sister and her three little boys, and my brother (who lives on the other side of the state). I am so blessed to have such a loving family! As always, we adults drew names to exchange Christmas gifts, and my sister drew my name. I mention this, because her gifts to me had a definite genealogical theme. She got me a year's subscription to Family Tree Magazine, and also a couple of acid-free, archival-safe photo storage boxes from Wal-Mart. Yippee! Spent some time looking into the life of Eva E. ([--?--]) LYTTLE / LITTLE of Benona Township, Oceana County, Michigan. 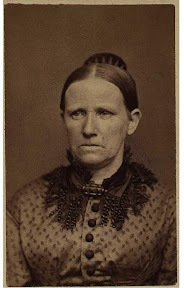 I am wondering if she is the missing sister of my ancestor, Charles H. ROBBINS, Evaline ROBBINS, who makes only one appearance with her parents in the U.S. Federal Censuses (1860 - listed as "Eveline L."). The family moved from Liberty Township, McKean County, Pennsylvania to Oceana County in the late 1860s. In the 1870 Federal Census, I can account for all of Joseph and Marinda ROBBINS' children except Evaline. I had assumed (yes, a bad word in genealogy!) that Evaline had passed away by 1870. However, a biography of Joseph in The History of Manistee, Mason and Oceana Counties, published in 1882, states that he has (emphasis mine) seven children, and includes "Evaline E." in that list. I started searching in Federal Censuses for any woman whose name started with "eva" or "eve" who was born c. 1853 (+ or - 2 years) in Pennsylvania who lived in Michigan. I kept coming up with Eva E. LYTTLE (sometimes spelled LITTLE), married to Joseph, b. c. 1840 in Ireland. Her father was born in New York and her mother was born in Pennsylvania (consistent with Evaline ROBBINS' parentage). She lived in Benona Township during the 1870 - 1920 censuses. He disappears after the 1880 census, and she is listed in the 1900 census as a widow. Of course, the 1890 census for that area does not exist. So sometime between 1880 and 1900, Joseph had to have passed away. I double-checked the 1890 Veterans Census, and did not find either one of them, at first concluding that he must not have been a veteran and/or died before 1890. Then I looked at the Civil War Soldiers and Sailors System website and made an interesting discovery. A Joseph LITTLE served in Co. I of the 42nd Pennyslvania Regiment (also called the First Pennsylvania Rifles)...the same company that Evaline's brother Charles and his step-brother-in-law Angelo Crapsey served in! Now neither Joseph nor Eva appear in the 1890 Veterans Census, so I am still in the theoretical stage here...trying to discover what does or does not add up. Eva LYTTLE had 12 children, 10 of whom were still living in 1900. Although widowed, she stated she had been married for 32 years (she was 48 years old) . If Joseph died right around 1899 - 1900, this means she would have been about 15 or 16 when she married. This is consistent with the family structure of Evaline ROBBINS, who likely would have been married by 1870, when she does not appear with her parents or siblings during that year's census. If I can obtain a death certificate for Eva LYTTLE, or a marriage record, it may determine if she is my Evaline ROBBINS. If you locate another Eva who might be a candidate, you could also send for death certificates for her children, which should give the mother's maiden name. Received an obituary for Emma Alice (LYTON) CHAPLIN from Christine Gray, RAOGK volunteer for Multnomah Co., Oregon. There wasn't a lot of new information, with the exception of the fact that she had two great-great-grandchildren living when she died. Emma's father was Henry LYTON, a Civil War soldier who had immigrated from Canada to serve in the Union. His real name was George TURK, and for some reason which is not quite clear, assumed the name Henry LYTON. 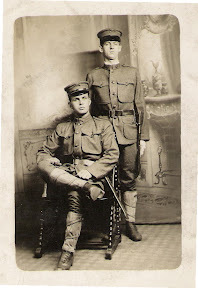 From Shawn StGermaine, I received via e-mail a photograph of Arthur Roy ROBBINS taken during his military service in WWI, as well as his obituary, and the obituary of his brother Albert. She also sent a newspaper article written about his wife, Ellen HANSON, who lived to be over 100 years old; Ellen's obituary; and their son Russell's obit and funeral card. Sank in a storm on an ill fated boat." That presents and goodies and toys I forgot. I'd not have forgotten to shop for such thrills. With a sleigh full of toys and ol' Santa Claus, too. And track soot on the carpet (I could wring his short neck!). I had no Christmas spirit, you'd have to agree. And filled all the stockings (I felt like a jerk). He spied my research on the table all spread. "A genealogist!" he cried (my face was all red!). "I know what it's like as a genealogy bug,"
To genealogy folk who can't find a thing. "Now off you go to your bed for a rest. To his team which then rose like the down of a thistle. "Family history is fun! Merry Christmas! Good night!" Received an e-mail from Shawn StGermaine, who is a sister-in-law of a descendant of Ben Frank ROBBINS and Helena SWEET. 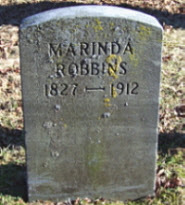 She has added both grave info and photos of the ROBBINS family to the Find A Grave website from West Cemetery, Hesperia, Michigan, including photos of Joseph and Marinda ROBBINS' graves (graves which another photo volunteer had been unable to find this summer). 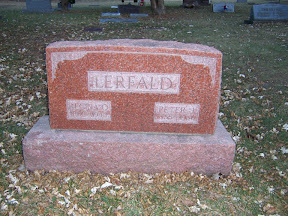 Anne S. Anderson and her husband (Find A Grave photo volunteers) kindly gave of their time to locate and photograph the graves of my husband's great-great-grandparents, Peder and Regina LERFALD. 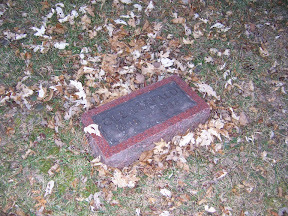 Our records indicated that the LERFALDs were buried in Lone Pine Cemetery, Woodville, St. Croix County, Wisconsin. Mr. and Mrs. Anderson went to three cemeteries in Woodville, ending up at Zion Lutheran. 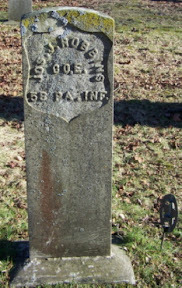 They found not only Peder and Regina's shared headstone, but the headstones for two of their sons, John and Ole (named respectively for Peder's and Regina's fathers). It's not clear at this point if Zion Lutheran and Lone Pine are two names for the same cemetery, but it appears to be so. I have to do some more checking, perhaps with the St. Croix Valley Genealogical Society or the St. Croix County Historical Society. The good news is that since I know they are buried at Zion Lutheran Cemetery, I am assuming that they may have been parishioners of Zion Lutheran Church. Perhaps I can find some church records that can help me "humanize" this family...so that they are less names, dates, and locations, and more people with needs, wishes, failings and strengths. I found a lot of helpful information at the St. Croix County USGenWeb site, including a history of Woodville. Seems this area was part of the "Big Woods" of Wisconsin, made famous by Laura Ingalls Wilder's first book, Little House in the Big Woods. Above is a photo of Peder and Regina on their 50th anniversary in 1931, probably in Woodville. Look at the size of Peder's hands! Peder Johnsen LEFALD and Regina Olasdotter LERFALD were first cousins, although not on both their fathers' sides, as it would seem by their common surname. Peder's father, John Nilssen LERFALD, and Regina's mother, Ane Nilssdotter LERFALDHOLMEN, were siblings, children of Nils Pedersen LERFALDTRØEN and Randi Olasdotter LERFALDHOLMEN. The variations of the LERFALD surname indicate the various farms in the Lerfald area of Norway (east of Trondheim) where the family members last worked before immigration. In other words, LERFALD and its variations, are place names which became surnames. It's been very difficult finding the LERFALDs in U.S. records after they immigrated (between 1866 [Peder and parents] and 1874 [Regina and mother]), and they tended to use patronyms. Trying to find JOHNSENs (Peder) and OLSENS (Regina - masculine version of Olasdotter) or their parents' patronyms of NELSON (for Nilssen and Nilssdotter) and PEDERSEN/PETERSON in Minnesota and Wisconsin in the late 1800s - early 1900s, is a challenge, to say the least! My Genealogy Gift List: Victoria's Secret? Never! The other day, my 16-year-old daughter and I were watching television together when a commercial for Victoria's Secret aired during the break. The gist of the message was "every woman wants Victoria's Secret for the holidays." I rolled my eyes and said to Missy, "Not this woman. Give me death certificates or census records any day!" As I thought it over, I realized that there were actually a few Secrets I'd like, none of them having to do with women named Victoria, however. For instance, there's Mariah Emily DAILEY and her daughter, Emma Alice LYTON, my children's father's 2nd-great- and great-grandmothers, respectively. Just exactly where were they when the 1880 Federal Census was being taken? They should have been in Iowa, specifically in Thurman, Freman County. Mariah's first husband, George TURK, assumed the name Henry LYTON, and immigrated to the U.S. from Ontario to serve in the Union Army during the Civil War. After his death, Mariah married German immigrant John KLINDER in 1875. By 1880, Mariah and John had two children, Nancy Florence and Laura Luella, as well as Emma and Agnes LYTON from her marriage to Henry. Mariah's Secret or Emma's Secret would be great gifts for Christmas! And in my own ancestry, I have yet to figure out Mary Jane's Secret...Mary Jane FREDENBURG, that is. My 2nd-great-grandmother was 8 years old in 1880, yet she and her six-year-old brother, George Franklin FREDENBURG, are missing from the Greenwood Township, St. Clair County, Michigan home of her widowed mother Cornelia (McCLELLAN) FREDENBURG, younger brother William Anthony FREDENBURG (age 3 1/2), older half-sister Sarah E. FREDENBURG (12) and paternal grandparents Anthony and Hannah (FOX) FREDENBURG. Can't find them anywhere in Michigan, or the U.S., for that matter. I did get Helen's Secret and Rena's Secret for Christmas last year. My children's father's paternal grandmother, Helen Mary WESTABY, and her mother, Rena (LERFALD) WESTABY, went missing, along with father George Rice WESTABY, III, during the 1920 Federal Census. I thought I had figured it out when I read George's obituary a few years ago. It stated that he had come from Montana to Washington State in 1920. "Aha!" I thought. "That's why I couldn't find them...they were moving, en route across the Northwest." I was right...sort of. I was given some significant missing details by my children's paternal grandfather during our 2005 Christmas visit. He told me that his grandfather George had been employed by the Northern Pacific Railroad in Montana, along with George's father and brothers. Seems George and his brothers made a little extra on the side by selling brass they stole from the railroad. George apparently sold to the wrong person, and managed to discover his mistake shortly before his impending arrest, making a midnight move with Rena and little Helen west to the Yakima Valley, where they likely hid out at the home of George's cousin, Charles WESTABY. If they weren't exactly in transit when the census was taken, it is certain that neither Charles nor his wife would have divulged to a government employee (i.e. census enumerator) that they were harboring a fugitive from the law! And I did uncover another Mary Jane's Secret this year...I think. 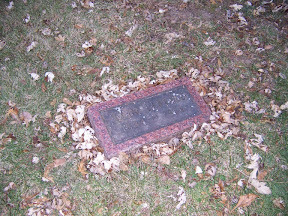 Mary Jane BARBER, my great-grandmother and daughter of Mary Jane FREDENBURG mentioned above, was married many times. In fact, she apparently was married so many times, even her family members may not have known the exact count. 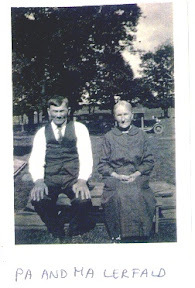 My records show she first married my great-grandfather, Howard Merkel YORK, when she was only 14 years old, in 1924. That unhappy union ended three years later. Mary Jane later married her step-brother, Archie Louis KELLER, when both were in their thirties. After that divorce, Mary Jane married what we had believed to be her third husband, Jay DUNLAP. It was my searching for Mary Jane in the 1930 Federal Census that led to my theory that there was another husband between Howard and Archie. Since I couldn't seem to find Mary Jane, I looked for her older brother Jim. I found a man with his name, the right age, birthplace and parents' birthplaces in Manitowoc, Wisconsin. Coincidentally, there's also a Mary Jane KUPSH in Manitowoc, age off by only one year, born in Michigan, parents born in Michigan. Ordering Arthur KUPSH's marriage record to Mary Jane should clarify if this is my great-grandmother. Interestingly, I asked Uncle Jim's widow if she had ever heard that her late husband and sister-in-law had lived in Wisconsin. She said no; however, Jim's widow came late into the family, as a second marriage for both Jim and herself. She may not have known Mary Jane's Secret. My genealogy gift list for myself (and for you!) is to uncover a few more family secrets in 2007...a few more surprises, a few more times exclaiming "so THAT'S where they were!" and many more genealogy happy dances to jig! Love your post! Who has a need for Victoria Secret when there are juicier secrets out there just waiting to be uncovered? Ancestry has added a great number of records to its Immigration Collection, and I was able to find my husband's immigrant WESTABY and WILSON ancestors today. George Rice WESTABY, I (1822 - 1894) and Ann WILSON (1822 - 1902) arrived in New York on May 22, 1850 on the Western World. Accompanying them was George's brother Charles (1825 - 1897) and a three-year-old Emma WESTABY, a new name in our family history. Was she a niece (Charles' daughter? He married for the first time--so we thought--in 1852 in Illinois...or perhaps another sibling's daughter?) George and Ann were newlyweds...their marriage was recorded in the General Registry Office in June 1850, so they had to have been married sometime between March and May. They were married in Glanford Brigg, Lincolnshire, England, and both George and Charles had been born in Barrow-Upon-Humber in Glanford Brigg. 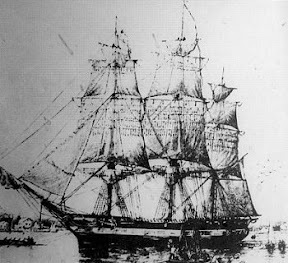 Also on board was a John WILSON...perhaps a relative of Ann's, although our current family history doesn't list a brother by that name. There are also some small WILSON children emigrating with what appears to be a mother and step-father named MILLTHORPE. John WILSON's family is listed on the passenger list between two MILLTHORPE families. Could the WESTABY, WILSON and MILLTHORPE families emigrating together also all be related to each other? Very likely. I need to do some more detective work! I also found some info online about the Western World. 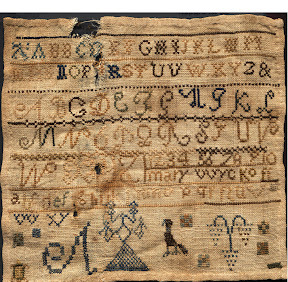 Apparently she sunk off the coast of New Jersey in 1853, and is a scuba diver's paradise. Heard from Christine Gray, RAOGK volunteer for Multnomah Co., Oregon. She will be looking for obits for Emma Alice LYTON and John Franklin MARTIN. Requests reimbursement of 25 cents per obit (copying fees) and $1.25 parking fee. She's done a lookup for me before; found Leona Mary MARTIN's obit a month or so ago, and did a great job. Also heard from Joyce Obland, RAOGK volunteer for Rosebud Co., Montana, willing to look up obits for George Rice WESTABY, II, Reuben Wohlford SNOOK, and Elizabeth NEARHOOD. She requests reimbursement for gas (50 cents per mile is the standard donation...however, she has a 60-mile round trip to do her lookups), plus $1.00 per obit copy. I e-mailed her back and told her I will have to wait until after the holidays, as the $30.00 for gas is a little much right now. Lastly, I heard from Linda Kolinski, RAOGK volunteer for Los Angeles Co., California. She had done an online search in ProQuest Historical Newspapers in the Los Angeles Times (1881 - 1985), and was unable to obtain an obituary for either Clark Pleasant R. TOLLIVER or Senna COLLINS. Regina was Norm's great-great-grandmother, and she married her first cousin, Peder Johnsen LERFALD. Family records indicate she came to the U.S. in 1874, not 1868, as her death record infers. 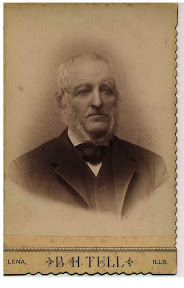 Peder immigrated in 1866, according to family records. I have not been able to find them in Ancestry's Immigration Collection. But Norwegian names can be complicated. They may have used a different last name, depending on the last farm their fathers worked before immigration. Or they may have used patronyms. Johnsen and Olasen/Olsen would be Peder and Regina's respective patronyms, and both are extremely common names. The Anna Nelson referred to in the death record was their middle daughter. Norm's great-grandmother, Rena, was their youngest daughter and youngest surviving child. It appears that Anna cared for her mother after Peder's death. My next plan is to have an obit search in the Woodville papers.